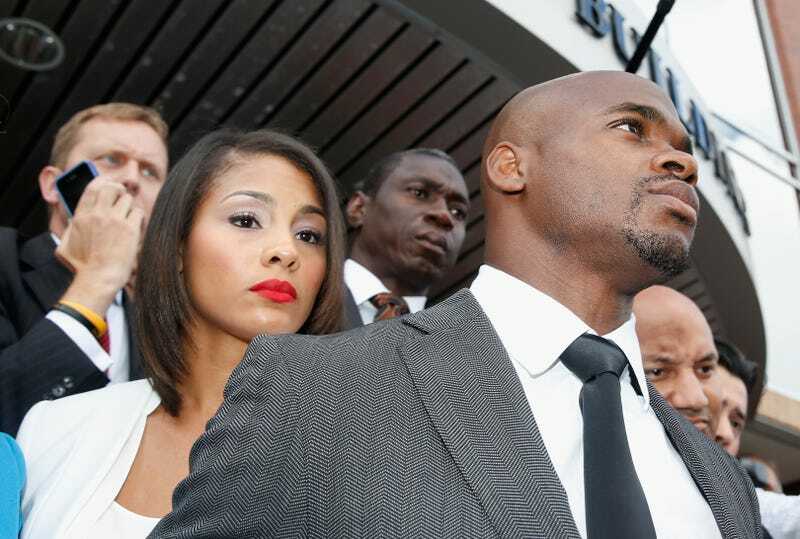 Since pleading no contest to child injury charges almost two weeks ago, Adrian Peterson has been embroiled in a dispute with the NFL about when he can return to the field. A Facebook post from Adam Schefter reveals that Peterson and the NFL had previously agreed to a disciplinary hearing scheduled for yesterday, but Peterson didn't show up. There is a confusing and interrelated mess of issues here. On Monday there will be a conference call regarding whether Peterson will remain on the exempt/commissioner's permission list, that weird and rarely used purgatory where players can remain suspended indefinitely but still collect their paychecks. This is the most important hearing in connection with when Peterson will play again. But it's not the only one. "We informed the union that we were unwilling to postpone the hearing beyond this week given that the player and union had both expressed a strong desire to resolve this matter as soon as possible and we had been given no meaningful reason why Adrian and the union could not appear and participate," said a league official. "We offered other alternatives for this week, but those also were not acceptable. We also have yet to receive more than cursory materials in response to our requests for information on the case. Accordingly, we went forward with the review on Friday as scheduled. The bolded part here is key, as Peterson and the NFLPA's previous statements indicated that they wanted this entire mess resolved as quickly as possible, and accused the NFL of dragging its feet. The League office seems more focused on creating an arbitrary disciplinary process for Adrian instead of honoring a signed agreement to remove him from the Commissioner's list. Finally, the NFL had previously claimed that this process was moving slowly because Peterson and the NFLPA weren't providing certain requested documentation. Now we know at least part of the reason why: an NFLPA spokesman told Schefter that Peterson's lawyer gave the NFL a letter stating that they couldn't turn some documents over because it was against Texas law, where Peterson was charged.